By Ed Valentine – Ed works with Opta Sports in Leeds as a football analyst. He concentrates primarily on UK teams in all competitions. 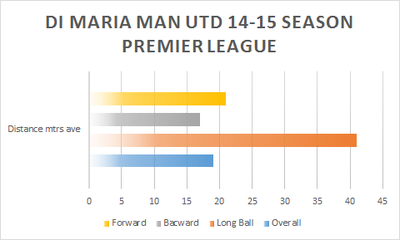 All data or visualisations used in this section are courtesy of OPTA. In this section of the website I think about beating the bookies on the football pitch. In a similar vein to the horse racing festivals over the years I aim to win “fantasy” money by selecting teams before every game week across the EPL, Serie A, Ligue 1, Bundesliga and La liga and calculating the best strategy by which to go about placing bets on them. Bets will be placed on domestic league matches only. An imaginary amount of €50 will be staked every week. Odds used will be the best value offered by the main bookmakers in the days prior to kick off. In contrast to last year, this season's 'beat the bookies' will not be constrained by betting rules or the teams that must be selected. Essentially, it is Ed (the analyst) Vs. Paddy (the bookie)! With the losses amounting to well over €200 it's not possible, unless absolute caution is thrown to the wind, to come back to the black. Looks like Paddy has made it 1-1 for the series - if losses can be limited to double rather than treble figures that will look like success from here. There is some good value offered in La Liga this week with two home wins on the slip with Sociedad and Bilbao. Similarly to 2 weeks ago the treble was going well up to half time in the final game - it's a shame there is no cashout facility. It will be hard to win back the €175 of losses with only 3-4 weeks remaining. A good place to start trying is with Monaco who, although lost to an excellent Juventus side, know how to put the goals away. I once heard a Sky pundit say Arsenal will let you down. This has certainly be the case for out money pot this season. Palace's win means that extra risk will need to be taken if the overall total is to recover to the black. This week's selections are below. A disaster for the pot last week as Marseille failed to win what looked a routine game. The project is at the point where greater risks are going to be taken and the best place to start is with Arsenal. The model says a draw is the most likely score however Arsenal have a 54% chance of victory. Chelsea's unconvincing win away to Stoke has brought the pot back to profit. This week we focus attention on the continent with Marseilles and Roma. Monaco didn't let the pot down with a narrow 2-1 win last week. With about 10 weeks or so of the season to go it's time to consider the current €10 loss as break-even territory. It's now a case of winning each weekend until the season ends. This week Paddy must have had his eye too closely on Cheltenham as he has given very attractive odds for Chelsea to beat Stoke away. It's a difficult place to get a win but we'll be hoping Costa, Hazard et al can do it on a wet Saturday afternoon at Stoke. This game was priced as highly as 1.73 but expect the odds to drift dramatically before half time for any lay betters looking to make an instant profit. The model predicts a a 57% chance of an away win with 1-2 being the most likely score followed by 0-2 and 1-1. Free scoring Monaco did the business last week with a 4-0 win. Zlatan failed to elbow his way in to the match against Bournemouth and let us down by failing to capitalise on home advantage and 45 minutes against 10 men. We'll stick win Monaco this week who play 6th place Bordeax at home. The Monégasques have the return leg of their champions league knock out round game against Man City in the coming week but they should have enough in reserve to win this one. A good double win last weekend continues the ping pong nature of the the fund. Consistency is required now to push on and land it firmly in profit. United and Monaco offer good value as a double, hopefully they pay dividends. The rollercoaster nature of the red and black swing was apparent again last week as Hertha held Bayern. Hertha would have won had it not been for a very very late equaliser. Regardless it was a no win weekend. We're sticking with Bayern, surely they will at home to Hamburg on Saturday. Fingers crossed. Comfortable wins last weekend at both the Emirates and Old Trafford ensured there is some daylight, albeit under €100 between Paddy and the pot. A win this weekend should see a 10% return on funds invested which is a reasonably healthy margin at this stage. We have to get the first and with no Premier League this weekend we'll focus on continental action. It's on a knife edge. The total account falls from red to black like a ball on a roulette wheel. Hopefully some safer bets will bring some consistency. This week we're staying with the Premier league as Arsenal look for their first win in February while United are at home to Watford who have enjoyed minor success on the road to the bigger teams this season. The slight increase of a draw is not high enough to decline the bet at slightly better than evens pricing. Let's see what happens. With FA cup action this weekend the focus is on the continent. RB Leipzig, who have slipped to 2nd place in Bundesliga will play 3rd placed Hoffenheim. France's Ligue 1 provides some good value as Lyon entertain Lille. ​Following a longer than planned rest period Beat the Bookies is back and the aim for the new year is to play cautiously for the short to medium term. As such, the selections are below. There was very little time to enjoy the mid week profit given by Liverpool doing a job on Boro. The profit now represents 5% return on the overall spend. Hopefully this will become double figures soon. Games below for week 17. The busy December schedule in the EPL picks up pace with this round of midweek games. Chelsea could put more daylight between them and the next best as Arsenal reverted to type following a good run of games. Tonight Man United's trip to Palace looks to be the pick of the games but we'll focus our money on Liverpool's trip to Boro. Another break even weekend - the double double very nearly paid good dividends but Leverkusen missed a penalty thanks to Hernandez trying to out smart the Freiburg keeper. Regardless this weekend provides the chance for the account to get back to the black. Following last week's double win the net loss is now under €20. This is manageable as there is scope to go into the black by the end of this weekend's games. There are a number of top of the table clashes around Europe with Chelsea visiting Manchester and El Classico being the pick of the crop. Despite the big teams playing each other there is some excellent value this weekend with the rest of Europe's top teams carrying slightly higher odds than usual. This weekend we'll place 2 doubles - details below. 2 out of 3 last week was only good enough for a €2 profit - breaking even really. This week the value offered for Man City and and Bayern offer a chance to get the deficit down to single figures. Hopefully Pep and Carlo can return to winning ways following poor European results during the week. Domestic actions returns with a bang this weekend with Dortmund vs Bayern, United vs Arsenal, Inter vs AC and Atletico vs Real as the pick of the games. All televised of course.Following Week 11's poor showing it's time to steady the ship and play relatively safely. The aim is to cut the deficit to below €50 which would allow for an evens bet to potentially bring the account into profit the following week. The challenge is not to chase the loss and run into an unassailable deficit. Hopefully Paddy will be paying out the full potential returns on Sunday evening. Last week was a very successful matchday for the project. The deficit has been closed to €10 and another successful double this weekend will launch the account into the black. City will be looking to consolidate after a good win against Barca while Napoli, who are on an indifferent run of form, will be intending to keep the pressure on Serie A leaders Juve with a home win this Saturday. Following a poor run of form over the last 3 weekends it's time to turn things around. Paddy has offered some good value across the European leagues but due to recent losses it's best to keep things simple. Fc Koln and Lazio could have featured in this weekend's bet but the Arsenal Milan double provides the best value. A fool and his money are soon parted. Paddy is no fool and in a turn around over the last 3 weekends the pot has now gone southwards. The "safe bets" of Chelsea, Dortmund, Arsenal and Inter let us down with no returns in the last 3 weeks. The current scenario is below and there will be emphasis on returning to winning ways this weekend. After a bad weekend last time out it's time to recoup though chasing losses is never a wise option. There is some good value following Man City's disaster in Barcelona midweek Plus Arsenal and Liverpool should enjoy some routine wins at home to lesser opposition.......when has anything been routine for Arsenal. Elsewhere Lyon are at home to St Etienne and Barca hope to put pressure on Real as they look to win a third match in a row in all competitions. Thanks to the generous odds from Paddy the pot managed to end up €14.50 better off despite losing 1 bet. Not too far away from treble figures and still only six weeks in. It can all change though as the cushion is not yet big enough to absorb 2 - 3 weeks of bad luck. Following last week's defeat to Paddy I have had to get slightly adventurous with selections. Atletico and Spurs look good as a double while Lazio should do the business against Pescara. The season is still in it's infancy but there are some big games across Europe. The two Manchester clubs go head to head with Pep and Jose looking to get an early psychological advantage in what will be part chess match part bare knuckle fight. We're not betting on this one as it's too close to call but early projections show a narrow 2-1 victory for Jose's men. This will likely change as the line ups are announced. France is the destination for this week's bets. A Lyon win will ensure the weekend breaks even. There was nothing to be positive about last weekend - no profit. Ed vs Paddy has more of a continental feel this week as there is some reasonable value across La Liga and Serie A. Bilbao will provide a difficult test for Luis Enrique's squad though I expect to see a comfortable away victory. Fiorentina looked impressive at times against Juventus last weekend and should register their first 3 points of the season at the Artemio Franchi on Sunday night. Yes yes and yes again, 3 wins this weekend allowed us to enjoy a net profit of almost €24. The international break will give time to update the betting model with last minute panic buys across the top leagues. More analysis will follow too following the next round of league games plus an insight into how the model works. Europe's major leagues kick off this weekend and with it hopefully the gold rush. There is some good value across the market with the pick of the bunch below. Real are well priced and if they win the pot will grow regardless of the outcome of Napoli's game. A casual glance at this weekend’s scores across Europe will tell you that it’s business as usual for the ‘big teams’, other than perhaps Arsenal who were lucky to avoid a defeat against the reigning champions. Despite an unlucky draw in Serie A the pot made a tiny profit. Napoli went 2 goals down to Pescara but managed to erase the deficit with 20 minutes to play. They were awarded a penalty with 10 minutes to go but the referee changed his mind after consulting the 5th official behind the Pescara by-line. Sociedad could be described as a bogey team for Real and despite going 2 goals behind in the 1st half the home side made the European champions work in the second half. Zidane maybe looking to play a more territorially tactical game focusing ball retention in their own half with long through balls to exploit the pace of Bale. The data demonstrates examples in the pre Zidane era vs the current state of play. Two of Madrid’s goals last night came from assists within their own half. It will be interesting to see if this continues against the stronger sides in the league. New TV money, new managers, new players and new reigning champions. Surely Leicester cannot repeat the achievements of last season with Conte, Pep and Jose all arriving to win the trophy. This season is set to be a box office heavyweight fight at least in the Premier League with the big 4 looking for 3 points early doors. A great start for the pot. The profit made virtually washes the face of the €72 made across the entirety of last season. With continental Erope kicking off this weekend the scope to make a steady profit increases. Check back here on Friday for our weekend selection and then early next week for results and our first analysis into the selected matches. The chart below plots my performance over the course of the season. I managed to recoup significant losses toward the end of the season and turned a profit of €73.06 for 15/16. That said, I was only in the black for 6 of the 31 weeks. Beating the bookies is no easy task. For the final time this season bets will be placed, and from the position the pot it is we can still make a few quid, but probably not even enough to buy a pie and a pint at a Premier League ground. A return to the betting shop this weekend following a brief absence. Can the pot salvage something in the last few weeks of the season? Real Madrid's clash with City next week has pushed the Spanish outfit's odds up this weekend as they face Barcelona's bogey team away at the Anoeta Stadium. Not long in the season to go. It's time to go big or go home. A double win this weekend will greatly reduce the deficit and could give the pot a chance to turn some profit if things go our way. Can Bayern bring their Champions League form back to the Bundesliga this weekend? A win would do nicely as it's crunch time for the pot. This week there is some decent value in the market but to get the most of what's on offer a slightly risky but generally safe accumulator double has been placed. Aguero and Messi should help the pot in it's recovery. Simplicity has been key to the more successful weeks I have had. So when I saw Chelsea priced at 1.75 to win away to Norwich I had to bet. Chelsea have cost the pot quite a bit this season but a win against the Canaries might be something to tweet about. Following the defeat to Barcelona on Tuesday Arsene Wenger was quoted as saying that the Spanish outfit are 95% through. The odds certainly are against the Premier League side so like our betting selection this week he'll have to be brave in his tactics. This week we have gone for a tricky away game for Roma. No point in playing it safe anymore. At some point the tables must turn. Nearly €200 down with 14 game weeks to go is more than a challenge. Turning the pot around to at least break even will require a string of flawless weekends. This weekend sees Arsenal face Leicester which some pundits commenting that if Leicester win they'll have one hand on the title. Arsenal nor Leicester are teams in our panel so we'll be focusing attention on Stamford bridge and Parc de Princes. It’s time to take some increased risks and this week we’ll be playing an accumulator in an attempt to claw back a bit more of the debt. Bayern are great value at 1.6 while Barca should run in a bundle of goals against Levante. Match: Levante vs Barca Odds: @1.18 This will be a double which means the combined odds are 1.89. Potential returns at a stake of €50 are €94.50. Another defeat for the pot. The one week Bayern don't win... while Juve are on a 13 game winning streak in Serie A. The milk isn't getting back in the glass however so for the remainder of the season the target will be to break even. Our bets will be placed on 2 of Europe's finest teams this weekend. Surely the pot is due a win. Hopefully Messi and Co. will deliver thw returns. Thanks to Di Maria and Messi the pot is now turning back. A loss at the weekend would have been disastrous as the debt would have reached over €200. Instead we are within a few risky accumulator of getting back to zero. It's looking bleak for the pot. These loses are looking unassailable. Still, there is some time to recoup a modest profit but the reliables need to start performing reliably. City and Roma both drew their previous matches so they're due home wins this weekend aren't they? Beat the Bookies returns after the festive break. With the pot almost €90 in arrears there is much ground to make up. David Butler is in for a week to replace Ed. He is going to keep it simple - single wins for Schalke, Bayern and Roma. Week 18 went well with Schalke, Bayern and Roma all winning. Going into the Christmas break the pot is still in the domain of losses but at least we are now only back into double digit losses facing into 2016. Ed will return with his predictions in the new year. Man City showed some form during the week to top the group. With less injury problems and a price of 1.30 against managerless Swansea it's hard to over look them this weekend. Elsewhere, Barcelona have what should be a routine game against Deportivo. We're going for broke in an accumulator as the pot needs to recover from last weeks losses. The weekend got off to a great albeit shaky start with City's very last minute win against the Swans. Barca's draw served as a fulcrum point for the pot which stopped it from moving into profit - instead the pot now rests more than €110 in arrears. The continental Christmas break may allow the top teams to reassess and hopefully put a run of wins together. This week sees some poor value for our selected teams. As a first, we'll be placing 1 bet only. A win will get us back in the black but a loss will wipe us out for several weeks. The pot is in trouble and the losses are becoming too big to recoup in consecutive weekends. There's still time however. It's a results business and Bournemouth's victory speaks for itself. Hazard is having a poor season. He and Jose need to win more points from now until the end than they did at this stage last season just to have a chance at the top 4. Following the defeat in Turin to the Italian champions Man City, who are really lacking Kompany, will be hoping for a comfortable victory at home to the Saints. AS Roma drew last weekend against Bologna in soggy conditions. Edin Dzeko will be hoping the goals flow as easily for his side as they look to press for the Scudetto. The pot got off to a great start with Man City cruising to victory. Roma were stunned at home which piles the pressure on Totti and co. The pot is still in red but is a manageable loss. Not much more than €10 down but we're approaching Christmas so the season is passing by. Domestic action returns this weekend with very little choice this with El Classico, Juve facing a tricky away game at the San Siro and Schalke v Bayern going head to head. Regardless of value football fans are in for a treat this weekend and on Sunday we'll provide analysis into the data from the a selected game. Selections are below. Barca crushing Real in the Spanish capital was quite something. Ronaldo may as well have been playing Barca on FIFA 16, he’d probably have had a better look in. I wonder does the FIFA 16 Ronaldo run into his own team’s box to help out? One take home point from Barca’s win was the “played as a team” approach. 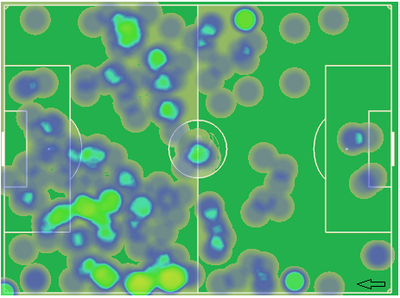 The heat maps below show how Barca’s front men featured more and had more influence in their own box than Real’s front men had in theirs. 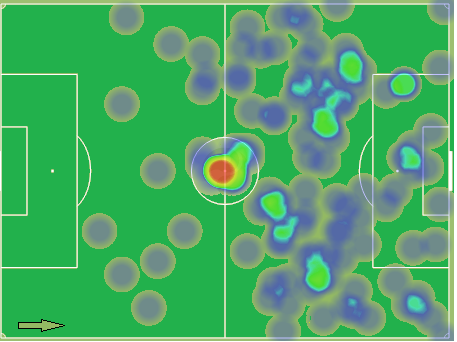 Neither Bale nor Ronald nor Benzema set foot inside their own penalty area during the game. Barcelona’s forward players covered more of the pitch and came back to help out their defenders throughout the 90 minutes. It seems Ronaldo, Bale and Benzema are not guardians of the Galacticos! As a reward for their journey to Spain in midweek the Man City fans will be treated with a trip to Birmingham to face Villa. 1.44 is very high price for a game that should be routine for Kompany & Co.Juve who despite a below par season have brought us a lot of profit face Empoli and will be looking to improve on their mid table position. Elsewhere, PSG are at home are looking to bounce back from defeat to Real in the Champions League. At odds of 1.18 lets hope they do just that. It was going so well until about 3.27 pm on Sunday. 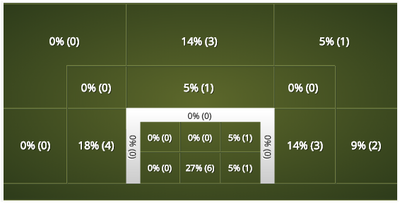 Man City were going to score – of course they were, they had close to 60% possession and dominated the territory. Guzan’s reflex save from point blank range and the crossbar stopped the pot from making an appearance in the black. Below we examine how Man City didn’t make the most of their possession on the edge of the area and were wasteful in creating clear-cut chances. City registered 3 attempts on target with 1 hitting the bar and other than Guzan’s reflex save the Villa keeper wasn’t forced into any heavy handed shot stopping. The away side created little from distance which hurt them as the Villains parked the bus and stole a point from the Citizens. We aim to make it three weeks out of three as far as profitable returns are concerned. To do this we'll need to keep it simple as there is volatility in Serie A and Chelsea may be in for another scare on Halloween against Liverpool. If all come off we'll be back in the black. Both Manchester clubs clash on Sunday Lunchtime, the odds on a City win do not stretch far enough relative to their chances of winning so we'll leave this one. The model does suggest a 2-1 win for City however. Elsewhere there doesn't seem to be great value - Real are away to Celta Vigo priced at 2,00. Celta are level on points with both EL Classico clubs after 8 rounds of matches so this should prove a trick encounter for Ronaldo & co.
Ed is slowly getting back to that reference point of zero - two good gameweeks are pushing him back into the domain of gains. David Butler is in for a week to replace Ed. He is going to keep it simple - Wins for Chelea and Man City! I'm glad to say I lent a hand in helping Ed get back in the black. Albeit far from a risky bet, Chelsea and City came up trumps to return a €17.25 profit and reduce the overall deficit. Mourinho has said that this is his worst period in management. Man City have lost two EPL game son the bounce. Surely this is the weekend when both clubs win. We think so and have placed an accumulator which could make or break the next few weeks. Elsewhere Barca look like great value, albeit away, to struggling Sevilla who have won just once this season domestically. Aguero's 5 goal haul looked set up the weekend nicely. Things took a dive when Barca went 2 goals down early in the second half. Chelsea ended any chances of securing a slight profit. PSG spared a clean sweep of defeats with a 2-1 home win thanks to 2 penalties from "Ibra". The pot is now almost a full game week down. Thr weekend following the international break we'll publish a breakdown of where the money has been won and lost. The pot has returned to profit albeit a little more than €7. There is some great value this weekend with Chelsea travelling to Newcastle priced at 1.65. The Magpies are "in a crisis" and Jose will have no sympathy for under fire manager Steve McCLaren. Elsewhere Roma and Bayern will be looking for 'routine' wins as the Italian club welcome Serie A newcomers to the Olimpico while the Bundesliga champions face a potential banana skin away to Mainz. This week was a scale down of the project to date. Two easy wins and two unlikely draws. Chelsea and Real had the chances to win but didn’t and that has cost the pot close to €40. 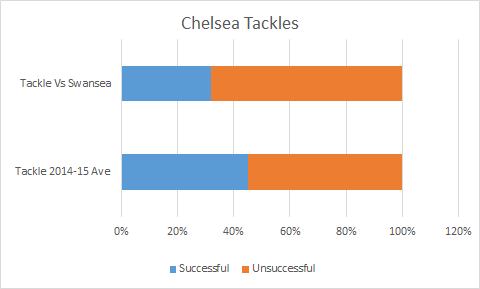 The graphic below demonstrates that out of Chelsea’s 16 attempts 10 of them were following key passes in open play (the other 6 were individual efforts i.e. no assists). Only one chance was created inside the box. 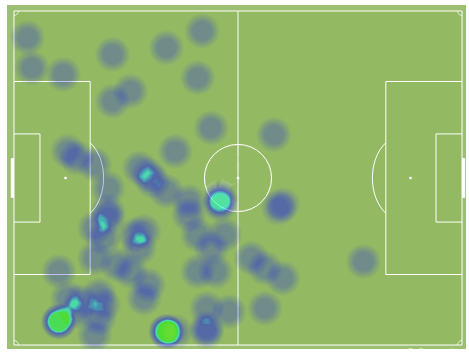 Newcastle made 22 clearances inside the area and held on by crowding the blues out. 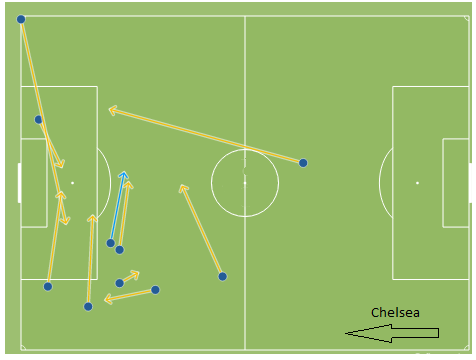 McClaren parked the bus and rarely had less than 6 players in the box when Chelsea were on the attack. The second graphic is Eden Hazard’s heat map. He couldn’t influence his team from closer than 20 yards. Still a couple of Euro down, the pot has the chance to recover itself into profit. Bilbao have suffered 4 defeats in their opening 4 games and we hope this trend continues against Real. Leonardo Blanchard. Unknown to most football fans but well known to Paul Pogba and co. The Frosinone centre back chose the 93rd minute of the clash with Juve to score his 1st ever Serie A goal. The equaliser meant the pot missed out on an additional €12 but Benzema made sure we still had a chance of some profit as Real beat Bilbao 2-1. All eyes, and cash, will be on this weekend's action as Roma will be looking to beat Carpi and Chelsea taking a trip to St James' Park to face struggling Newcastle. This may prove to be a key turn around in our battle against the bookies with all selections winning. The key to success was choosing less games while opting for a more likely but lower return. Juventus’ form gave them a very good value price of 1.83. There was very little chance they’d fail to win another Serie A game on the bounce. 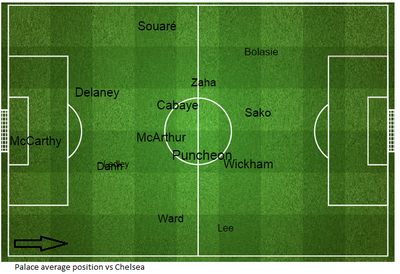 A similar point to note for Chelsea who dominated for large parts of the game against Arsenal and won comfortably. Our model predicted that West Ham had about a 44% chance of leaving the Etihad with a result. Essentially 9 times out of every 20 in that scenario Man City would fail to win. City were wasteful with the ball, just like they were against Juventus in the Champions League. They passed the ball 3 yards to a marked player several times when a more direct ball was a possible option. 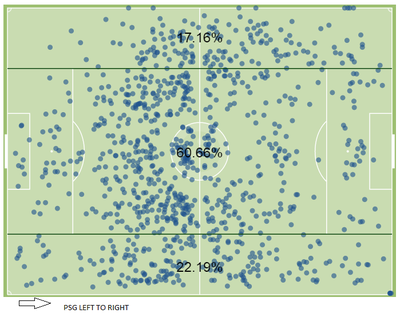 This is highlighted with City making 273 backward passes which accounts for 42% of all short passes. The graphic below highlights how many passes City put together to no avail. 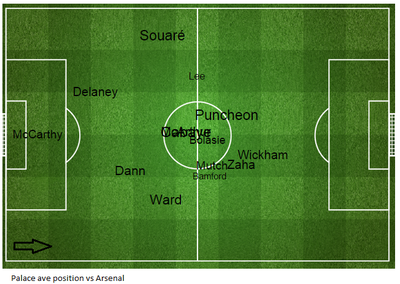 It harkens to the style Arsenal play by passing and retaining possession albeit with little direct offensive threat. There have been some peculiar results across the top leagues. This has caused the pot to drop to almost €30 in arrears. There are over 250 games involving our teams remaining so plenty of scope to turn this round. But like an under fire Jose Mourinho the turn around must start now. Normal service will be resumed this weekend with match analysis following on Sunday evening. An interesting set of fixtures this week with some big head to head clashes. In Serie A the gladiators do battle in Rome with the giallorossi playing host to Juventus. Rules state no bets can be made on this one and it's just as well because our model shows that a 1-1 draw is the most likely result. In Ligue 1 PSG are away to Monaco at a whopping 2/1. It's a potential banana skin for the Parisians following Monaco's victory on the night (knocked out on agg) to Valencia during the week. Palace didn’t so much as win the game as Chelsea lost it. The blues dominated passing and possession and did everything but score. Chelsea were wasteful in the box and failed to convert chances which ultimately cost them victory. 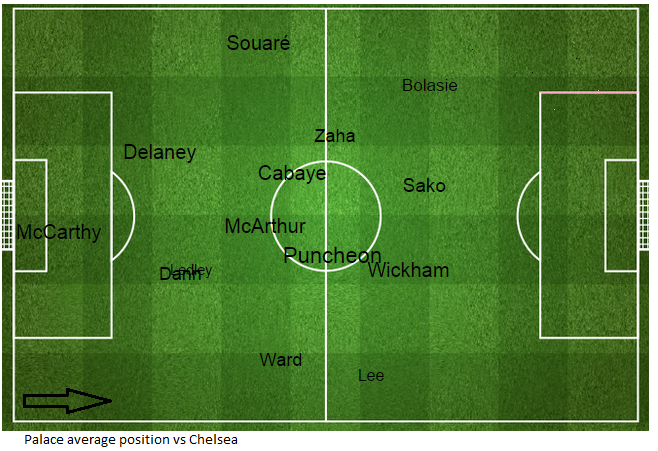 The Eagles were more adventurous across the full width of the pitch with Bolaise, Sako, Wickham and Lee enjoying the freedom to roam and cause problems for the Chelsea defenders. 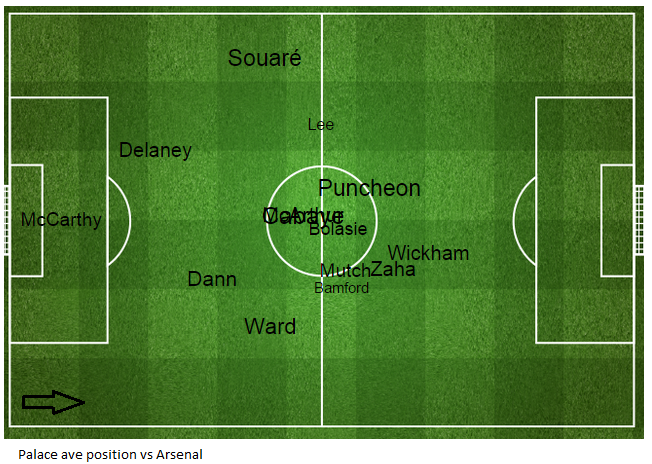 As the graphics demonstrate the Palace players had less influence over Chelsea than they did against Arsenal (demonstrated by the size of the names) but they did enjoy the ball in better territorial positions. It’s not how much of the ball you have – it’s where you have it! There is still plenty of scope to turn this around. I just wish I’d chosen PSG at 2/1 instead of Chelsea. After a successful series of bets last weekend the start of La Liga and Serie A allow the chance for yet more selections to bring success. Chelsea, off the back of a defeat to their main league rivals last Sunday will surely register their first win of the campaign against the Baggies. Schalke playing at home against newly promoted Darmstadt represent excellent value at 1.44. Neither Juve or Roma will see any of our fictional €50 this week as better value selections exist elsewhere. Roma at 1.67 are the best odds of any of our selected teams this weekend however they are playing away to Verona where they drew 1-1 last season and may pose as a "fregatura" as they say in the piazze of Italy's capital. This weekend's selections are below. Skills for show, score for dough. Real did nothing of either on Sunday night and their failure to score stopped us from breaking even across the weekend. We’re in profit overall but not by a significant amount. It is only week 3 and it’s important to note that none of our selections have lost yet as we’ve had 7 wins and 4 draws which shows that fundamentally this system has potential. Our models correctly demonstrated that we should have stayed away from Roma and Juventus as the giallorossi drew and the bianconeri suffered a defeat at home. Roma play Juve at the weekend so we won’t be betting there either. After mixed results last weekend, the start of Bundesliga tonight gives propensity to claw some cash back. Selections are limited with Chelsea's trip to the Etihad which our model shows that City will score 1.078 goals to Chelsea's .989 (bets are not made when our selected teams play each other). Simply put a great week. All selections won generating a €27.06 profit for week 2 which has washed the face of last week’s losses. At the risk of sounding like Arsene Wenger there is a lot of football still to play and Serie A and La Liga have yet to begin. Man City vs Chelsea allowed us to focus on the other European Leagues with two games from Ligue 1 and one from Germany. Bayern dominated in a 5-0 win while Lyon just about got there with a 1-0 away victory. PSG scored twice with no reply as they looked commanding against Ajaccio whose annual budget is less than the €14 million new boy Di Maria will earn this season. But will Di Maria fit in the PSG system? Some of the numbers say so. 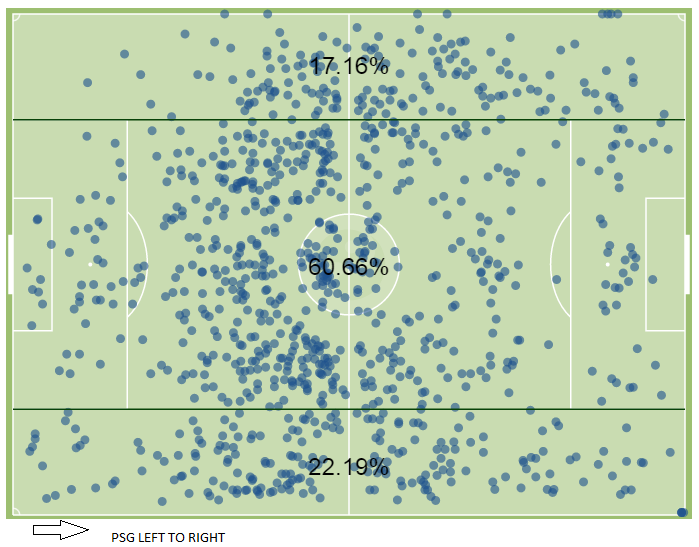 To the left below is the touch map for every PSG player vs Ajaccio on Sunday night. It fits nicely with where di Maria would expect to position himself. 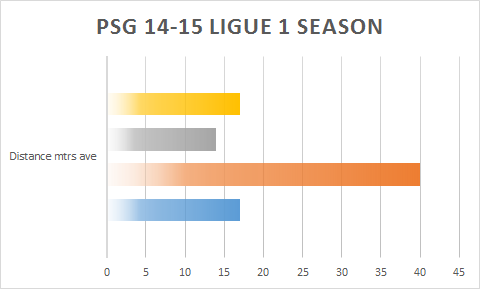 Further to this, his passing distances match up with the PSG team average based on last season, as the other two pictures below show. €14 million a season may well prove to be a bargain but will it yield a 13% ROI after two weeks? Success always begins with failure. The selections failed to render a profit overall with two wins and two draws. If only Fakhir’s first half strike for Lyon had gone in instead of hitting the post. If only Swansea didn’t score that penalty. How did Chelsea not win? Their numbers in key areas were below where they’d be expected. Losing out to Swansea in the air resulted in the Blues losing traction in the midfield battle which enabled the Welsh side to cross The Bridge with a point. This aerial defeat also affected their chance creation. With 8 attempts made on goal this is only two thirds the number Chelsea would except to register in a Premier League contest. With La Liga kicking off at the weekend and Seria A the week after it’s all to play for on the pitch and at the bookies.